Gulfstream Aerospace Corp.’s newest offerings, the Gulfstream G500 and Gulfstream G600, will join the Gulfstream fleet on display at China’s Shanghai Hongqiao International Airport next week for the Asian Business Aviation Conference & Exhibition (ABACE). 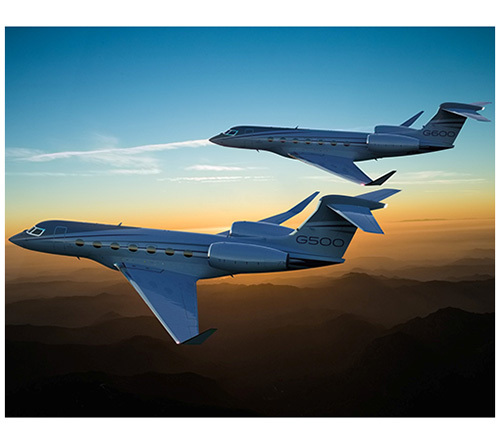 The show will mark the G500’s 19th stop on a world tour showcasing its enhanced design and performance capabilities. “Asia is Gulfstream’s largest international market, and we are well-positioned in both fleet performance and significant product support investments to exceed customers’ demanding travel requirements,” said Mark Burns, President, Gulfstream. “ABACE is the ideal opportunity for customers to tour the G500 and G600 and experience their unparalleled performance, quality, craftsmanship and design innovation,” he added. The G500 recently entered the final stage of its flight-test program, with anticipated U.S. Federal Aviation Administration type certification this year. It is capable of flying 5,200 nautical miles/9,630 kilometers at Mach 0.85. Gulfstream Aerospace Corporation, a wholly owned subsidiary of General Dynamics (NYSE: GD), designs, develops, manufactures, markets, services and supports the world’s most technologically advanced business-jet aircraft. Gulfstream has produced more than 2,800 aircraft for customers around the world since 1958.